In ''Happiness is a Violator'' we are faced with a woman who is giving nothing away. Her eyes stare blankly at the viewer and we are left with the intriguing title and many questions. 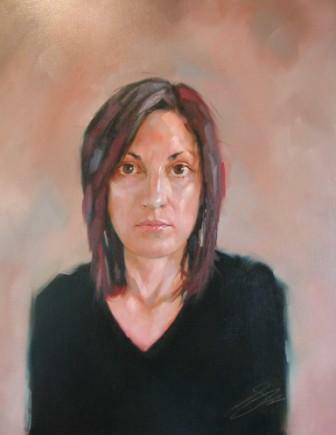 Simon Davis'' studies of women''s faces are contemplative and thoughtful but never flat, they always look fresh and real and full of life, this is no exception. Simon Davis skilfully uses light and shade to give real texture and life to his contemporary oil paintings. Simon Davis currently exhibits at Red Rag Modern British Art Gallery and RBSA where he won the Tanner Charitable Trust Prize in August 2004. In addition to Red Rag British Art Gallery Simon Davis has exhibited at other leading British Art Galleries. Each painting at Red Rag is sourced from the Simon Davis artist studio and like all Red Rag British art and Contemporary art can be shipped worldwide.